Photo courtesy of Birchwood Casey. For 2018, the good folks at Birchwood Casey (www.birchwoodcasey.com) introduced a nifty multi-tool they call the "Gun Plumber." This little gizmo looks like one of those folding hex key sets from Craftsman, Stanley, Allen and others. 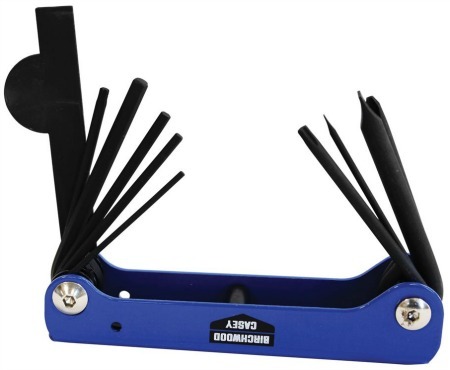 Like many shooters, I carry a folding hex key set in my range bag. However, the Gun Plumber goes well beyond common hex key sizes. It contains gunsmith recommended bits intended to cover almost all field or range repair needs. The Gun Plumber has multiple uses, from firearm repair and field stripping to everyday maintenance. it is all steel and well made. Like any quality tool, with moderate care it should last for many years. Four hex keys - 1/16", 3/32", 7/64" and 5/32"
When you think about it, these tools will allow you to remove the stock from your rifle, tighten a loose choke tube, tighten a loose scope mount, remove a scope in the field to access iron sights, tighten or remove the frame screws from a revolver or lever action rifle and many other common gun chores. Folded, the Gun Plumber measures 4-1/4" long and it is 1-1/4" wide. All steel, it weighs 6.7 ounces, so it is no lightweight. For me, one Gun Plumber is not enough. Having used this handy tool and discovered how useful it is, I want one in my rifle/handgun range bag, one in my shotgun (trap/clays) range bag and one in my hunting kit. The 2018 MSRP is $11.80, so even three Gun Plumbers is not a financial strain. Copyright 2018 by Chuck Hawks. All rights reserved.